About as fall as a pasta dish gets. Crispy bacon and creamy Gouda and pumpkin all in a baked pasta! Preheat oven to 350 degrees F. Chop bacon and add it to a skillet over medium-low heat. Let cook until fat renders out and bacon is crispy. Remove bacon from skillet when it’s crispy. Drain off grease, leaving about 2 tablespoons in the skillet. Add chopped onion, garlic, and paprika to the skillet and cook until onions are soft and translucent. Stir in pureed pumpkin along with half of the crispy bacon and gouda cheese. Combine well and then remove from heat. Season the pumpkin mixture with salt and pepper to taste. Cook shells according to package in salted water until they are al dente. Be careful not to overcook the shells or they will be harder to stuff. Drain pasta and rinse the shells with cold water. Then work with one shell at a time and spoon in a big spoonful of pumpkin stuffing into each shell. Place the stuffed shell in a baking dish. Continue until you finish all the filling. You should get around 20 shells. 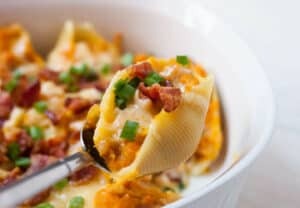 Cover shells with the rest of the cheese and crispy bacon bits. Bake shells at 350 degrees until cheese is melted and shells are hot, about 20-25 minutes. Remove and garnish with chopped chives. Serve while warm! This delicious recipe was brought to you by Macheesmo. Read the full post at https://wp.me/pkSYO-e06.